I figured all heirloom items would be sold through the vendor in the undercity, for horde at least. 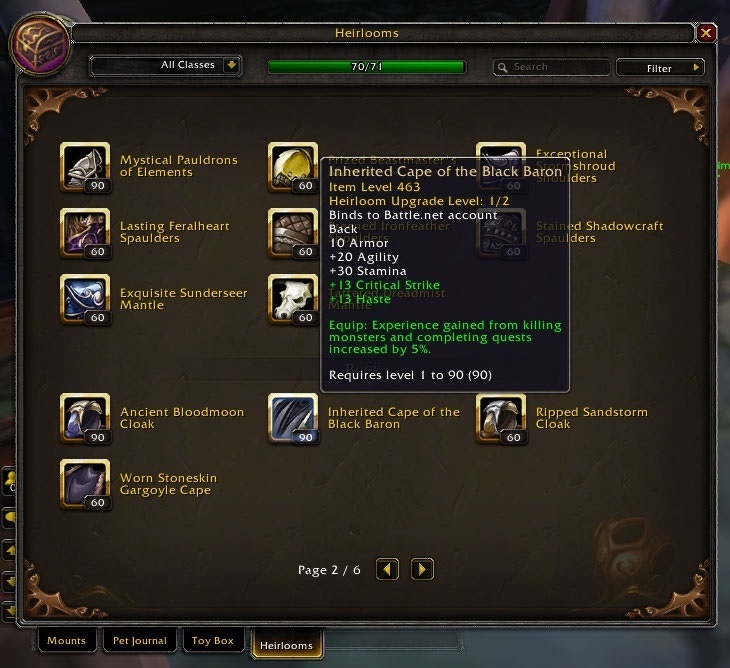 So between the guild and undercity vendor, we can purchase all heirloom items? So between the guild and undercity vendor, we can purchase all heirloom items?... Heirloom heads now appearing in Patch 4.0.3 as part of the new Guild Leveling/Rewards system. They have a 10% experience boost from quests and kills and stack with all other Heirloom items. They have a 10% experience boost from quests and kills and stack with all other Heirloom items. 25/01/2011�� Well, I'm not sure if you can actually keep the heirloom, but to buy it you actually have to have honored rep with that guild, so you wouldn't be able to just join and buy it. and @The Solx, the cloaks he's talking about does require only guild level 10. The cape and the helm are available from the Guild vendor once your guild has reached a high enough level (10 for the cape, 20 for the helm) Adding a Bloodied Arcanite Reaper to the mix may be a good idea: it may lack the experience bonus, but you get a good weapon that scales with your level. It is a guild reward of the Guild Achievement "Working Better as a Team", along with the other pants heirlooms in Mists of Pandaria. However, since it was created in Catacyslm, it only scales up to level 85. (I have full heirloom with pirate ring) At lvl 36 I didn't even get one level from finishing a dungeon with two quests. I hate being stuck in the old content I want to be in the "new" content but without paying for a boost. Looks like it's going to take well over a month to get to max level.